Liszt, Nuages gris (1881), mm.31-48. The most obvious resemblance, the one that initially caught my ear, is Liszt’s rising chromatic soprano line. Like the Wagner, there are three main phrases consisting of 4 to 5 notes, the first notes of each phrase have longer duration relative to the final notes of each phrase, the final notes of each phrase fall on a weak beat with the penultimate note serving as a kind of accented dissonance, and the entire ascent occupies the same register, ultimately arriving at the pitch F# (which, in both cases, eventually leads to G). Listen to the Liszt passage again (starting at the 2:13 mark in the above YT video). With these resemblances in mind, it’s easy to hear the Tristan prelude in there. The resemblances don’t end with the melodic ascent, however. 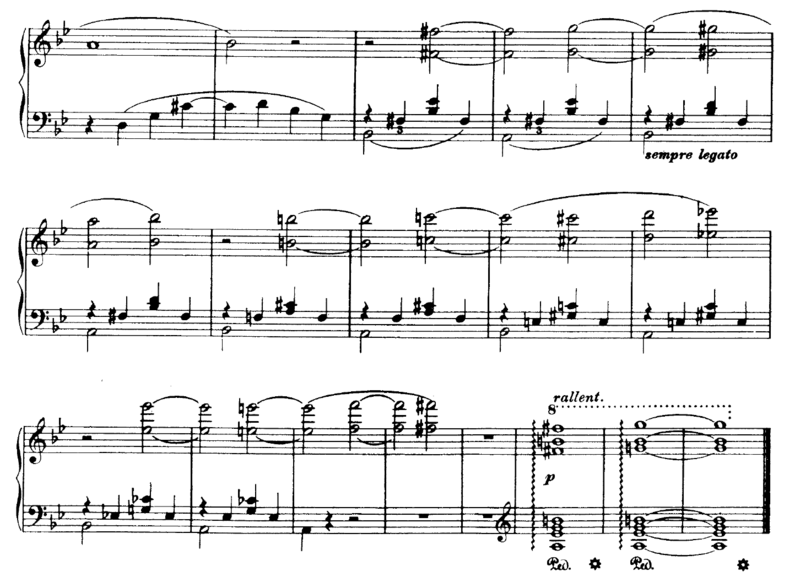 The left hand of Liszt’s piece crawls downward chromatically matching the chromatic descents that pervade the Wagner accompaniment. Furthermore, the bass arrival on A connects with what is generally considered to be the initial key of the Wagner prelude, A minor. Could this be Liszt borrowing from Wagner, whether consciously or subconsciously? Could he be commenting on or even parodying the Wagner passage from two decades earlier? I investigated a bit and things got pretty interesting. Kenneth Hamilton’s fascinating book chapter entitled “Wagner and Liszt: Elective Affinities” from Richard Wagner and His World explains just how complex the relation between the two in-law composers was at this time. Hamilton, admittedly not interested in refuting the traditional view that “Wagner exploited Liszt — both financially and artistically — and that Liszt allowed himself to be exploited” (p.27), devotes his attention to showing the dramatic impact each had on the artistic endeavors of the other. Below is a timeline of relevant events drawing primarily from events Hamilton’s essay. 1841: Liszt’s song “Die Lorelei” completed. 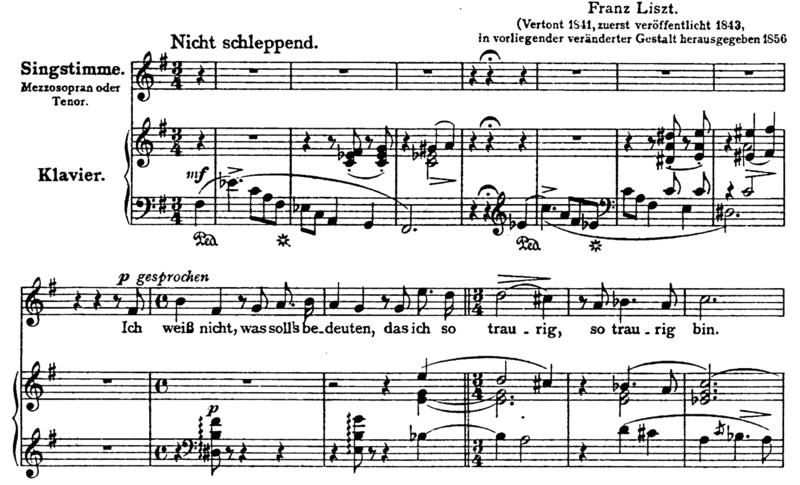 One instance of outright thievery is obvious: Wagner’s Tristan prelude opening is right there in the opening bars of Liszt’s song “Die Lorelei” from 1841, revised in 1856. Take a listen. In addition to the obvious aural connections, notice the E#-F# motion mimicked by Wagner’s prelude. 1844: First version of Liszt’s “Ich möchte hingehn” completed. 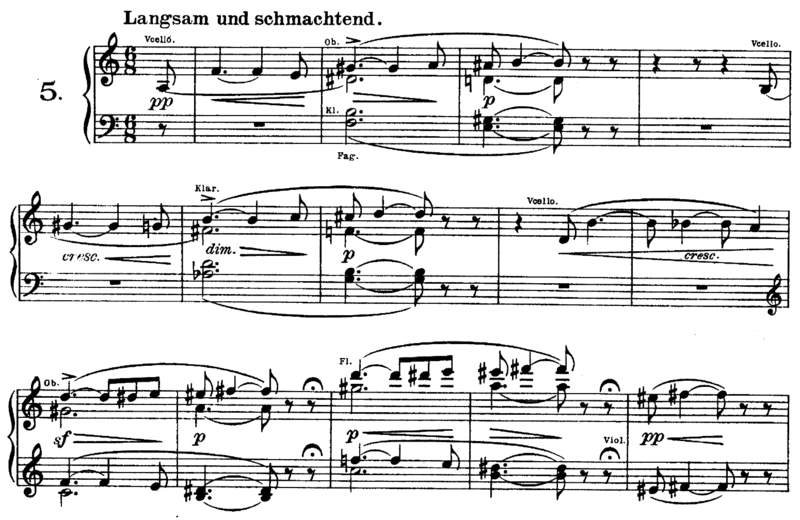 The infamous “Tristan chord” (bar 2 of the Wagner prelude) can be found in Liszt’s song “Ich möchte hingehn” originally composed around 1844, thus predating the opera by about 15 years. However, the truth is that Liszt inserted the chord as a quotation of Wagner much later, after Liszt had become familiar with the opera. 1847/?1849: Liszt composes the first of many Wagner transcriptions to come, the Overture to Tannhäuser. 1865: Tristan premiered, led by conductor Hans von Bülow (from whom he stole Cosima, Liszt’s daughter, to be his wife). Von Bülow is also responsible for the piano arrangement of the Tristan prelude excerpted above. 1881: Nuages gris completed, a few months after an accident falling down stairs left him bedridden and ultimately suffering from dropsy. 1883: Liszt’s Am Grabe Richard Wagners completed, a “disjointed, nostalgic sketch” that even further extends the tendencies of the Parsifal march. 1886: Liszt’s death. That Tristan was on Liszt’s mind at the end of his life is evidenced by Cosima’s claim that her father’s dying utterance was “Tristan!” — that is, if we are to take that story as being anything more than legend. 2 Responses to Liszt’s Nuages gris: a Tristan parody? Thanks, Keith! Wasn’t sure about this one, but I’m glad you found it interesting.